Forums - Gaming Discussion - GameSpot's old method of reviewing games was the best (Also Suikoden Review!). GameSpot died for me November of 2007, when Gerstman was fired for writing a critical review of Kane and Lynch. I don't consider modern GameSpot to be GameSpot at all. I consider the 1996 to 2007 run of GameSpot to be the best review, and game news site ever. Gerstman, Shoemaker, and Kasavin wrote some of the best reviews of all time. What I really liked about their reviews was that they had a method of taking apart every aspect of a game, and scoring it individually. So each catagory of Graphics, Sound, Gameplay, Replay Value, Story, Controls, and got its own score. After that there was another score called Personal Tilt, which let reviewers say how much they liked the game as a whole, or how well the different aspects mixed together. The final score was an average of these 6 to 7 scores (Story wasn't always used). I don't think this method of reviewing games was used for the entire time. I'm pretty sure they switched over to a half point scoring method in 2006. But anyway, I just thought that this method really forces you to think about every part of a game. Anyway, I've decided to start writing reviews in using this old method. Edit: Here's a review of Suikoden, that I did using this method. I'll add it to the official review section later. A bug on this site is slowing down posting the review in the normal section. 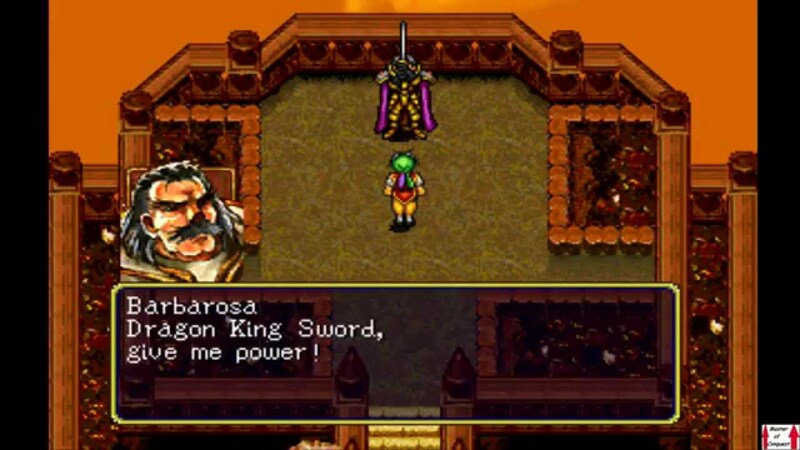 Suikoden physically looks like an early SNES game. This isn't always a bad thing, but Suikoden's sprites try to show too much detail with too little pixels. Sprites barely have discernible facial features, portraits look grainy, and environments are sometimes very basic. Had the game used some sort of chibi art style ala Final Fantasy 6 the facial features wouldn't have been a problem. Instead of trying to look like an Anime, Suikoden often tries to make its portraits look like its awful North American cover art. Other than those issues, the game looks fine. 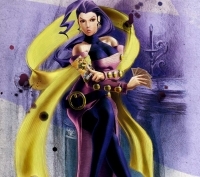 Enemies have interesting animations, like when a character warps through a giant playing card. Spells and attacks are satisfying to watch. Some spells warp spacetime, which is a fun to watch. Each character in this screenshot is supposed to have eyes. Can you spot them all? Just an example of how bad portraits look in this game. 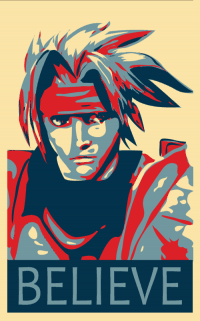 Suikoden has respectable music and sound. Nothing really stands out as awesome, or terrible, with the exception of a "dragon sound effect". Dragon roars in this game are just an Elephant trumpet. Thankfully you'll only hear this comical misstep about five times throughout the entire game. Epic spells have epic sound effects to match. Melee attacks have a satisfying clang to them. This controls just like any other JRPG with a few hiccups here and there. For starters you can't walk diagonally, so you'll often find yourself walking south, and then west in a quickly alternating fashion just to get a town that is to your southwest. You have to manually move items around in your inventory, and organize them yourself. This is a bit of a pain, but not gameruining. There's no cursor memory so choosing attacks and spells has to be done manually every single turn. 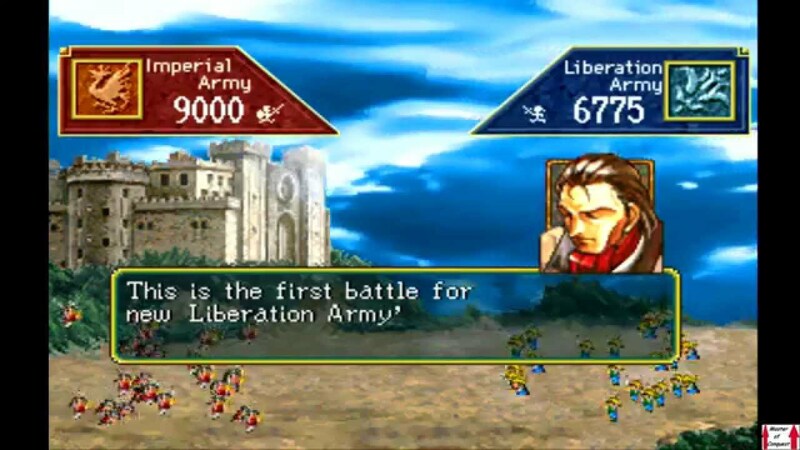 Suikoden is a JRPG, with 108 playable characters. You have to find, and recruit these characters to build your army, and castle up. 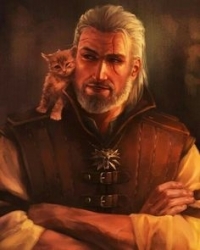 Recruiting characters often involves a small sidequest, or bringing the right item. Many characters in the game have unique abilities. If you put the right combination of characters into your party you can perform a combo attack, with two to three characters that know each other well enough. With 108 characters in the game you'd think leveling up all of these guys would be a massive chore, but Konami did an excellent job with handling XP. The closer you are to an enemies' level the less XP a character gets. The farther below an enemies' level the more XP a character gets. This means that you can quickly take a fresh recruit and have them almost at the same level as your veterans in four or five battles. Early on in the game you are able to recruit a character that sets up a gambling hall in your castle. This makes it almost too easy to raise funds to buy new equipment for new characters. Characters can be customized by equipping runes, and accessories. Runes either enable a character to use certain spells, or they have a secondary effect such as increasing crit damage. Many accessories will increase a certain stat like speed, skill, magic strength, defense, or luck. You can have up to six characters in your party at once, but the game usually forces two to three specific party members to come along. This isn't always a bad thing though, because I feel like the game just wants you to at least try a new character every once in a while. 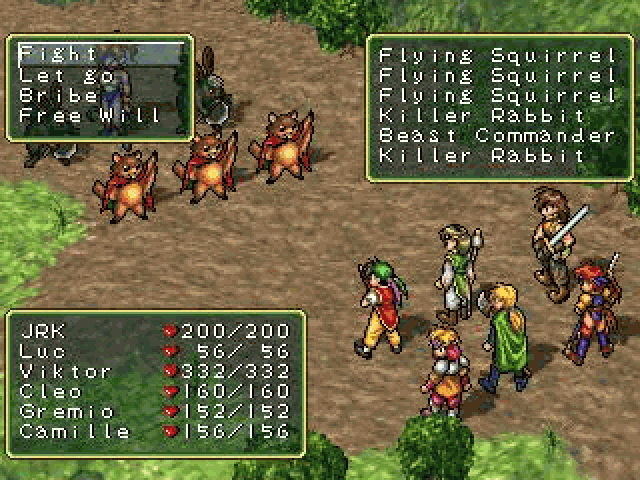 Suikoden follows the traditional town, dungeon, town, format of older JRPGs. In between this however are army battles. These battles are basically a game of rock/paper/scissors. Archers beat mages, mages beat soldiers, and soldiers beat archers. Each turn you order your army to attack with either archers, soldiers, or mages. Damage done to your army, and your opponent's army is dependent on what attack each army chose. Once you've beaten the game, Suikoden is easy to get through a second time. Knowing exactly where to go, and how to recruit characters on the second playthrough speeds up playtime significantly. This lends itself to replays very well. I beat it in about 15 hours on my second playthrough. My first playthrough took me about 25 hours. Trying out different combinations of characters keeps the game feeling fresh on consecutive playthroughs. This is just a little number representing how much I personally enjoyed it overall. I'm using the old GameSpot review format, because I feel that it forces reviewers to compartmentalize each aspect of a game, and review said aspects separately. A niche game that is a must play for fans of the genre, but skippable for everyone else. This is how games used to be reviewed period. There's also a reason I don't read reviews anymore. Nothing is broken down anymore. It's just a synopsis and what the reviewer feels the game should get. The above way has a nice break down and the whole is put together. Kinda looks like to how I used to review games here, but without having broken down scores for each category, because I don't think all of them have to weight the same in an averaged sum, that's just not how it works IMO, if it is so good at something but decent on other parts the good will very often outweight the bad, unless the bad is technical as a game filled with bugs that take away a lot of its potential greatness. Oh yeah, they were not the only, thus it 74 MC. But GameSpot review was specially bad if I recall it right, the reviewer got called out and said he played the game again and thought the same. That was one of the first reviews I've ever read and I remember it felt like the guy didn't play past the first disc (it has 4) and was too focused on what it wasn't (Final Fantasy) rather than what is was. I hope I'm not mixing it with some other review but I believe I'm not. GameSpot was the first english forum I've ever been part of, I remember trying to talk with people on the LoD forums there (in joint with GameFaqs) back in 2008 and spending more than one full hour to be able to write a post about as long as this one, very likely REALLY bad written too, lol. Yes. Just talk about the games in a normal way, don't give me your "writing skills" or attempt at skill. They focus so much of the review itself that they end up giving us an essay we have to pick apart. Just give us the info and tidy it up, then let us know how your play through was and how you enjoyed it compared to others in the genre. Simple. Clean. Focused. Factual.